One of the things I am proudest of was saving the back issues of my hometown newspaper, The Licking Valley Courier, after its offices were destroyed by fire May 15, 1985: The next day I waded through water to carry sopping-wet, burnt-edged bundles to a trailer and subsequently dried them out in the loft of a tobacco barn (assisted by others); later I had the papers microfilmed at the University of Kentucky Library. 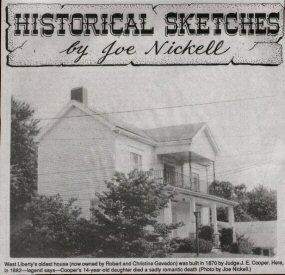 In addition, I was instrumental in getting my hometown's oldest house listed on the National Register of Historic Places (as shown in this photo from my column in the Licking Valley Courier, April 30, 1992), and I have been involved in many other preservation efforts. See also Archives Assistant, Museologist.